A few years ago, I was with an old timer down in Provence admiring the vast swathes of the purple Lavendin fields. The sun blazed and the intensive hum of bees. I always had a fondness for bees after that conversation. Never had I thought about the different value of plants producing nectar. Since then of course I discovered that many a garden full of flowers may not be nectar rich at all. 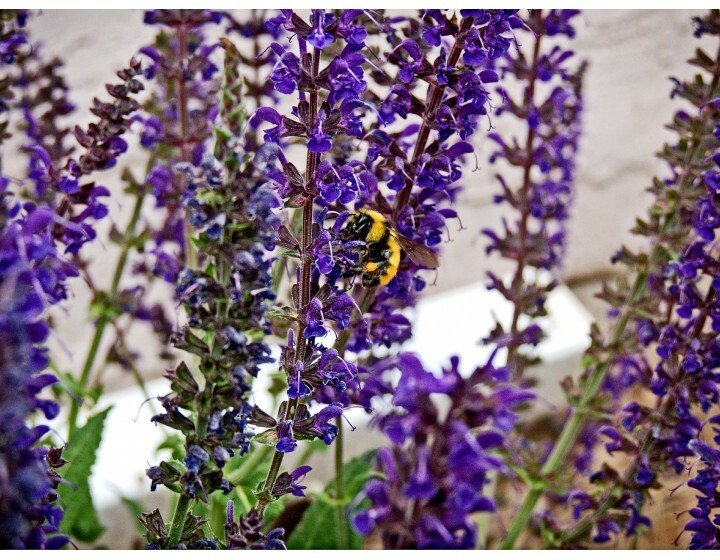 Certain flowers will attract and feed bees more than others and bees needs span over different times of year. There are two main types of bee; the Bumblebee and the Honeybee. Populations of both have suffered huge declines in recent years for several different reasons. 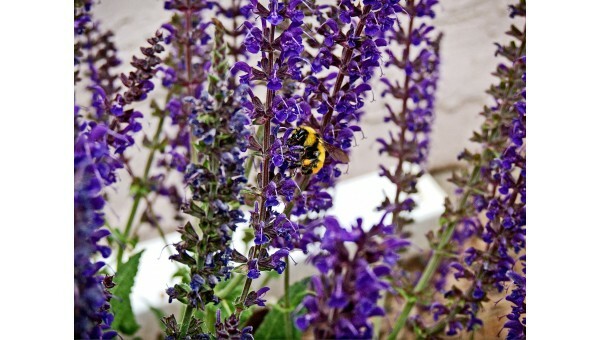 In the garden aim for a good variety of pollen rich flowers that have different flower shapes and a range of flowering periods from early spring to late summer. Bumblebee species have different length tongues that are adapted to feed from different shaped flowers such as foxgloves and honeysuckle. Honeybees have short tongues which are best suited to feeding from open flower shapes. Some trees and shrubs are also great for bees as they provide masses of flowers in one place. Choose winter and early spring flowering trees such as apple, wild cherry, willow and hazel. Commercially bees play a key role in pollinating many crops and are estimated to be worth millions of pounds to the UK economy. Some 35% of our diet depends on pollination of crops by bees. Albert Einstein the nuclear physicist said that if bees died out, humans would follow just four years later! The end product for you and I is Honey! How many flowers are needed to make honey? A lot. More than most of us can easily comprehend. To survive a year, a single colony brings in about 120kg of nectar- an astounding weight for a small insect. It's not as though individual flowers are generous with nectar, either. Most yield just the smallest of droplets. A standard jar of honey from the supermarket requires bees to make a million flower visits. A colony might produce 50 to 100 such jars per year. Bee & Honey Nourishing Bath Lotion with its piece of real beeswax! This is the product for you if you like bubbles so add under running water. Unfortunately, this contains SLS; a big no from many people and not our choice but if you want bubbles........ We mitigate the drying effects of SLS by clever formulation and Honey Nourishing Bath Lotion with its abundance of herbs and moisturising factors ends up gently cleansing and not irritating! Clever stuff if you like bubbles! And the Honey Babe range has a great Barrier Cream for baby’s bottom! Contains pure natural manuka honey renowned for its healing and antibacterial properties enriched with chamomile to soothe and protect baby’s tender bottom. Provides a protective moisture barrier to prevent soreness and irritation. Last but not least amongst our many honey favourites is Honey and Jasmine Shower Oil a luxury product to die for. Full of essential oils and natural wash active substances that'll look after your skin and not strip it. You will just love the aroma on your skin.